In the past two weeks, we’ve been updating you on the Ethiopian monitoring visit by CFTC’s Regional Program Manager – Africa, Amboka Wameyo, and Director of Programs, Heather Johnston. This week, I’m happy to bring you Heather’s final post, one she wrote on her way back to Canada after facilitating a Theory of Change workshop with our Ethiopian partners and country staff. For those of you who’ve been following this blog or are familiar with social change practices, the Theory of Change concept will not be a new one. Theory of Change is a way to get really clear on the long-term impact we want to create, AND get very disciplined about what we need to do today to make that happen. Our goal is to keep you fully informed of how Theory of Change is rolling out at CFTC – and the challenges and opportunities it brings as we strive to create lasting and meaningful change for children living in poverty. Theory of Change is allowing us to build on our 25-year history of doing great year-to-year work with our partners in Ethiopia and elsewhere, and to move to a multi-year approach that is transforming our organization, how we do the work we do, and how we measure our results. But we all know change of any sort is hard. It can be messy and exciting and sometimes frustrating, as Heather reports below. Change takes time and effort and patience, and requires support and understanding from everyone involved: staff, partners, funders, governments, our beneficiaries, our Board and more – all of whom contribute to the CFTC mission and vision. That’s why it was a great privilege in this year’s Annual Report to explain the intention behind and plans for how Theory of Change will shape CFTC’s work and re-shape the organization itself in the months and years to come. And also why I’m committed, through this blog, to bringing you the news of how Theory of Change is being implemented in the countries and communities in which we work, as Heather shares below. Fasten your seatbelts and stay tuned – change is in the air! 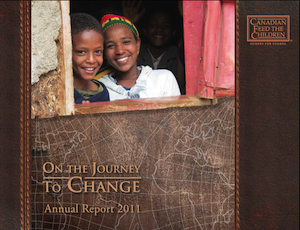 And of course, check out the CFTC 2011 Annual Report online when you have a moment! Theory of Change maps the route backwards from the outcomes we desire to the activities that will lead us there. 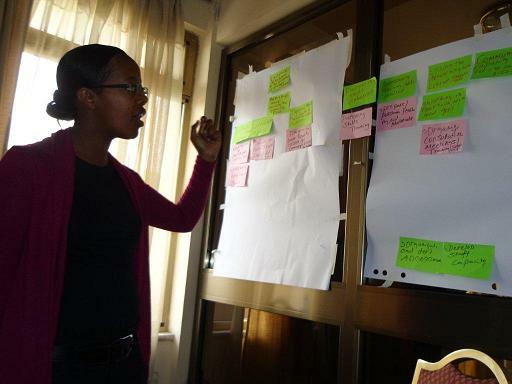 September 17, 2012, Toronto, ON–I’m back in Canada after a whirlwind trip to Ethiopia, where I had the pleasure of co-facilitating a Theory of Change workshop in Addis Ababa with our Country Representative in Ethiopia, Gebriel Galatis. Like so many planning workshops I have facilitated, this one was a mesh of ideas, experiences, debates, theories, dreams and aspirations. What made this workshop special for me was experimenting with the theory of change methodology to frame our planning process. Theory of Change requires us to define the social change we want to create and – most importantly – how we are going to make that change happen. It is not just descriptive, but a dynamic process that pushes us to produce a critical analysis of our work to ensure that our interventions in the field will really create the change we want to see for the long term. Our activities might be helpful to beneficiaries, but we must also ensure that they are leading towards sustainable change for the communities where we work and the country as a whole. This requires a long-term, collaborative and transformative approach. Hamelmal Yohannes of MCDP with ToC mapping in progress. One of the goals of the workshop is to produce a visual representation of our plans within a ‘map’ that traces the causal pathways that will lead to change. I’m not sure who struggled most with this process during the workshop … myself or the workshop participants, representatives of all four CFTC Ethiopian partners. In ‘theory’, I was facilitating the process, but in practice I think I was being led more than I was leading! 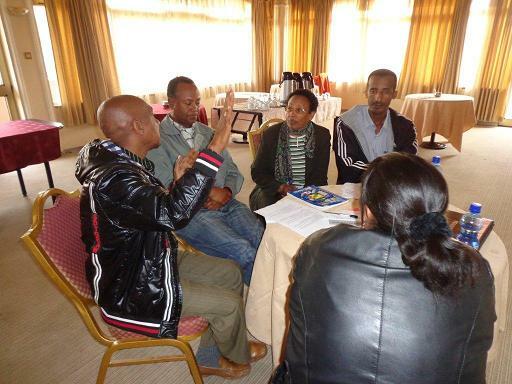 Our Ethiopian partners are so passionate about the work they do, it was truly inspirational. But it was challenging to channel all their passion and energy into a focused ‘theory of change’ that will drive their programming for long-term results. One of the key drivers of CFTC’s shift towards our own theory of change was the need to focus our work. Our Ethiopian program is typical of many of our programs: our partners have been carrying out many different activities across many different sectors. Moving to a Theory of Change approach will allow us to focus our efforts and resources in three key sectors: education, food security and nutrition. We will also have a fourth area that includes capacity building for CFTC offices and partners – as capacity building at the local level is critical to support sustainable, community-led development. However ‘focus’ is easier said than done. Each time we tried to narrow the focus of our work, one of the partners would protest, putting forward very good arguments on why we can’t possibly eliminate this aspect of our work. I found myself agreeing – yet I needed them to focus! Enthusiastic workshop participants (clockwise from front): Hatsey K’Mariam, MCDP (back to camera); Mesfin Kass, EDA; Teshome Shibiru and Beletu Mengistu, ISAPSO; and Yosef Zegeye, CHAD-ET. Our partner staff vigorously defended every activity they carry out – right down to the chickens in the chicken coop. It was frustrating and messy, and at many times during the workshop it seemed as if we were simply going around in circles. But such is the nature of participatory development: everyone is encouraged to contribute their ideas and expertise, and while the way forward may not be linear, everyone can feel a sense of ownership for the outcomes. I would be dishonest if I said the workshop produced the perfect country map for Ethiopia – which is the foundation on which activities are aligned when taking a Theory of Change approach. The good news is that we did manage to come out of the workshop with a very strong first draft. Our Country Office team will take this forward, working closely with the partners to finalize the map. The challenge remains to focus on a few key areas to create impact. My facilitation and leadership skills were put to the test, but I also had my faith renewed in the power of participatory development planning and the rich results that are possible when we create the time and space to listen to each other. Sometimes that means letting go of our preconceived ideas about what we think is best, and trusting that with the right support and good listening skills, communities impacted by poverty will find their way forward to long-term change. 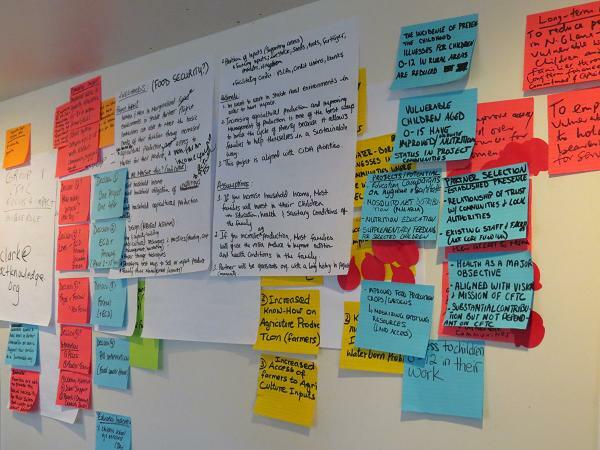 Theory of Change … it’s messy, but I love it.